A-HOTEL.com - Luxury and cheap accommodation in Kogalym, Russia. Prices and hotel, apartment booking in Kogalym and surrounding. This indicative offer was derived from the most recently booked accommodation in Kogalym and sort by the price, from cheapest Kogalym accommodation to the most expensive hotels. To select accommodation by your preferences we recommend to choose from 21 accommodation offers in Kogalym in total. By entering the dates of your overnight stay in Kogalym and using the filter tools you can sort the best possible accommodation for you. The entered dates of your stay are crucial for the most accurate offer as it derives all the online information on pricing and availability of Kogalym accommodation. Then you can book the selected Kogalym lodging (hotels, apartments etc.) immediately. Apartment on Surgutskoe Shosse 9 is situated in Kogalym. Guests have a private balcony. Offering free WiFi and city views, Apartment on Leningradskaya 25 is an accommodation set in Kogalym. This apartment features accommodation with a balcony. 1к квартира Дружбы Народов 25 is set in Kogalym. Guests staying at this apartment have access to a fully equipped kitchen. Offering free WiFi, Мини-гостиница «Заречная» is set in Kogalym. Kogalym Airport is 14 km from the property. Boasting a shared lounge and free WiFi, Kogalym Hotel is situated in Kogalym. Offering a restaurant, the property also has a bar. Boasting accommodation with a balcony, Apartment on Molodezhnaya is situated in Kogalym. Guests staying at this apartment have access to a fully equipped kitchen. 2к квартира люкс is set in Kogalym. Guests have access to free WiFi. 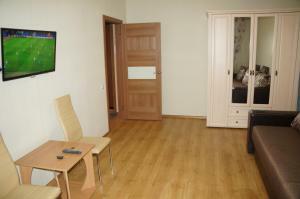 Apartment on Surgutskoye Shosse offers accommodation in Kogalym. The offered kitchen features a stove with an oven and a microwave. 1 комнатная квартира в Когалыме is set in Kogalym. Free WiFi is offered. Located in Kogalym in the Khanty-Mansi Autonomous Okrug region, Apartment on Leningradskaya 43 has a balcony. Guests may enjoy the free WiFi. Apartment Druzhby Narodov 18 offers accommodation in Kogalym. All units include a TV. Set in Kogalym in the Khanty-Mansi Autonomous Okrug region, 2k Kvartira Premium features a balcony and city views. Guests may enjoy free WiFi. Янтарная улица Апартаменты is located in Kogalym. The apartment features a satellite TV. Boasting accommodation with a balcony, Apartment on Pribaltyyskaya is situated in Kogalym. This property offers access to free WiFi. VIP KOGALIM is set in Kogalym. Guests staying at this apartment have access to a fully equipped kitchen. Set in Kogalym, Бакинская 35 provides accommodation with a balcony and free WiFi. Guests staying at this apartment have access to a fully equipped kitchen. Situated in Kogalym, Apartments on Mira 22a provides air-conditioned accommodation with a balcony and free WiFi. Guests staying at this apartment have access to a fully equipped kitchen. Apartments on Druzhba Narodov is located in Kogalym. Guests have access to free WiFi. Apartment on Surgutskoye Shosse 9 is located in Kogalym. Skiing can be enjoyed nearby. Featuring accommodation with a balcony, Молодёжная is set in Kogalym. Guests have access to free WiFi.